Need a safe and space-efficient way to store your Cardiac Science Powerheart G5 defibrillator? This reliable metal wall sleeve is designed to easily withstand the weight of your unit inside its premium carry case. It’s purpose is to identify the unit so that anyone can locate the defibrillator in the case of an emergency. Its bold lettering signals its purpose and its slim design makes it easy to fit into a limited space. Your defibrillator is the most valuable piece of equipment in your workplace. It has the power to save lives! A lot of people are hesitant to use a defibrillator, concerned that they may do more damage to the victim and worried about applying an electrical ‘shock’ to another individual. This concern is misguided. By understanding what a sudden cardiac arrest is and why a defibrillator is essential to treat such a medical emergency, any individual can be more confident to provide treatment to a victim. Sudden cardiac arrest is the stopping of the heart caused by arrhythmias as a result the misfiring of the heart’s electrical system. Arrhythmias are really irregular heart beats; rapid (ventricular tachycardia) or chaotic (ventricular fibrillation) or a combination. Failure of the heart to beat means that blood is not carried around the body to the vital organs, including the brain. In the instance of sudden cardiac arrest the brain is the organ that will be impacted first. This will happen in the first few minutes after the initial collapse of the victim. In fact, there is about 4 minutes before serious terminal damage is done. There are many causes of sudden cardiac arrest, and these may impact the old and the young. Coupled with a lack of symptoms, sudden cardiac arrests are a silent killer. The following are some possible causes of sudden cardiac arrest: – Heart disease – Extreme physical stress, which can cause the heart’s electrical system to stop working – Inherited heart disorders – Heart defects – Medications – Illegal or illicit drug use – Changes to the size or shape of the heart The key to the survival of a sudden cardiac arrest is the speed of intervention. Every minute that a defibrillator is not applied to the body of a victim means a 10% decrease in their chance of survival. This is a significant decrease. A defibrillator will enable the heart’s rhythm to revert to normal. By reading the heart’s rhythm the unit identifies the correct electrical pulse to apply to the body. When the heartbeat returns to normal the blood can again travel through the body, clear out the buildup of toxins that are generally constantly cleaned out of the cells, and provide oxygen back to the deprived organs. Your defibrillator should always be accessible and easy to identify for anyone that needs to act in the face of a medical emergency. Mounting the device onto a wall means that it is out of the way whilst still being out in the open. Clear lettering identifies the device. 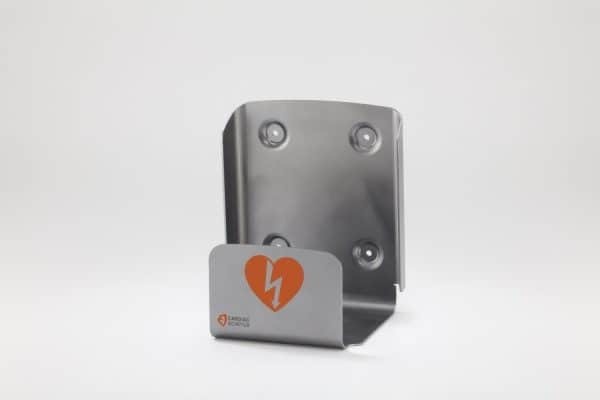 This wall mount is the perfect accessory for your unit so you can be sure that you will always have access to your defibrillator when you need it.